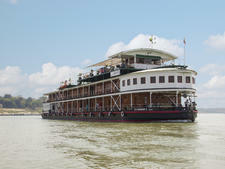 Pandaw River Cruises was established in 1995 as a revival of the Irrawaddy Flotilla Co., which operated passenger and cargo ferries on the rivers of Burma. 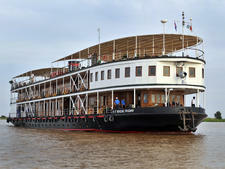 Pandaw launched with the restoration of its namesake steamer and began operating in the Mekong River in 2002, where four of its ships continue to sail today. Ships offer promenade decks with panoramic views. Itineraries feature remote, hard-to-reach destinations. Fares include daily shore excursions. Pandaw ships, which accommodate between 10 and 60 passengers, are all capable of reaching remote areas of Asia, including Vietnam, Cambodia and Burma. Because all of Pandaw's ships were specifically built for river cruising, the promenade decks play a large role in enhancing the passenger experience. Each ship features an observation deck and a promenade deck, designed to offer panoramic views. A buffet breakfast and sit-down lunch and dinner, all included, are served daily. Meals often feature exotic, organic produce prepared by chefs knowledgable in local cuisine. Pandaw offers a mostly inclusive experience -- all bottled water, soft drinks, juices, tea, coffee and locally produced beer and spirits are included. Imported spirits are available at an additional cost. Daily shore excursions and all meals are included in the cruise fares. Each cabin is air-conditioned and is equipped with a safe, luggage storage, wardrobe, writing desk, hair dryer, kimono, minibar, phone and slippers. Thann bath amenities, including shampoo, conditioner, soap and lotion, are included. Passengers can borrow iPads. Wifi is available in public areas throughout the ship. Because of the exotic itineraries the boats sail, satellite signals are spotty, so cabins don't have TVs. Vessels feature lecture rooms, libraries, spa facilities, shops, live entertainment, movie showings, gyms and traditional saloon. They also have hospitality desks, open 24 hours daily. Pandaw's passenger base is primarily composed of well-traveled Australians, Europeans and North Americans. The average age of passengers varies depending on factors such as itinerary and ship. Pandaw specializes in itineraries that feature remote, hard-to-reach destinations. Four ships in the Pandaw fleet sail three-, four-, seven- and 10-night Mekong itineraries between Saigon and Siem Reap/Angkor: RV Angkor Pandaw (32 passengers), RV Mekong Pandaw (48 passengers), RV Tonle Pandaw (56 passengers) and RV Bassac Pandaw (60 passengers). 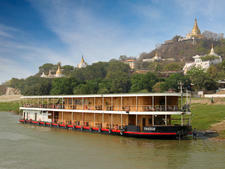 Seven ships sail one-, two-, seven-, 10-, 14- and 20-night Burma itineraries on the Irrawaddy and Chindwin rivers: RY Kalay Pandaw (10 passengers), RV Katha Pandaw (32 passengers), RV Kalaw Pandaw (40 passengers), RV Kindat Pandaw (40 passengers), RV Pandaw 2 (48 passengers, RV Orient Pandaw (60 passengers) and RV Indochina Pandaw (60 passengers). 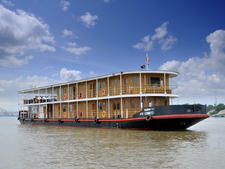 Pandaw also charters a number of its vessels annually to American and European river cruise specialists. 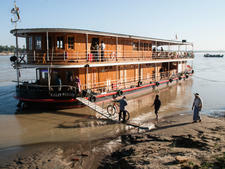 Pandaw operates cruises on Burma's Irrawaddy River and the Mekong River through Vietnam and Cambodia. Sailings generally range from one to 20 nights. Pandaw specializes in itineraries that feature remote, hard-to-reach destinations, and daily shore excursions are included in the cruise fares. While sample itineraries are provided, due to the nature of the rivers and other local considerations, routes are flexible and could change prior to boarding or even once onboard.